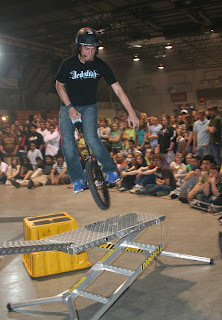 OM Arts International: Motivational Speaker and Extreme Sports Performer Inspires Audiences! Motivational Speaker and Extreme Sports Performer Inspires Audiences! This is a great opportunity for your organization to utilize a world champion performing artist and create an event that is sure to entertain, challenge and inspire! Dustin Kelm of UniShow has a dazzling show and a powerful message for people of all ages! Schools, churches, youth events, camps, and other venues have tapped into Dustin's amazing talents. Click here to watch a short video clip!